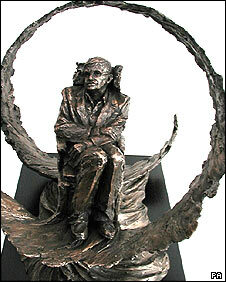 Professor Stephen Hawking will be depicted in a 10ft (3m) high bronze statue of him in his wheelchair. The £250,000 sculpture has been commissioned by Professor Hawking's colleagues at Cambridge University and will be sited near his office. Sculptor Eve Shepherd said she hoped to show the "power of Professor Hawking's mind and the fragility of his body." Shepherd has made a scale model of the sculpture, but is unsure when the full size version will be finished. The 32-year-old artist from Brighton has been following Professor Hawking in an attempt to learn more about his personality. Professor Hawking's office is in the Cambridge University Centre for Theoretical Cosmology.